The fictional version of Stephen Hawking is getting a lot of attention thanks to the biopic The Theory of Everything. 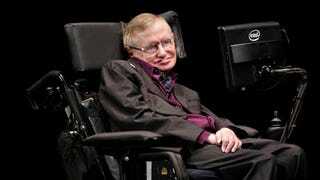 But real-life Stephen Hawking is far more badass than his big-screen counterpart. He's also up for discussing his theories on pretty much everything, as Wired's recent interview shows. I believe that the human race will not survive indefinitely on Earth without some disaster. I would like us therefore to spread out into space, so humanity doesn't have all its eggs in one basket, or on one planet. Fair enough! Space colonization it is. The program is activated by a small sensor on my glasses. I'm writing these answers using it. Intel is going to open source it, to make it available to other disabled people. Intel has also tried facial recognition, though the range of messages that can be conveyed is limited. I have not had much success with brain-computer interfaces. My carers say it's because I have no brainwaves.